Marine life is full of patterns and features invisible to the naked eye. The ability to capture detailed high-resolution close-ups of common reef animals requires a broad array of skills and knowledge in multiple areas. BioQuest Studios applies similar techniques for both video and still images. In addition to cinematography, we produce fine art images preserving accuracy of colours and morphology. Therefore the images are suitable for taxonomical and research illustration purposes. Traditional macro and supermacro techniques are limited by the depth of field of the image. A quality macro lens renders only a small and thin portion of the image in-focus. We extend the depth of field with focus stacking in photography and video. Focus stacking introduces tremendous amounts of detail into macro images. Such images can be printed in large sizes without loss of sharpness. In fact, a lot of features emerge when printed on a large scale. These features would otherwise be too small to be previewed on a website. A focus stack is a composite image requiring multiple exposure of the same subject at different focus points. Stacking software analyses images and combines the in-focus parts among all exposures. Therefore, the whole image generation process is similar in concept to HDR (High Dynamic Range), where the dynamic range is extended instead of the depth of field. On average, our still supermacro photographs have 20-60 exposures stacked together. However, hundreds or even thousands of images are typically acquired to produce a single shot with superior composition and quality. In addition, we employ deconvolution algorithms in image processing to push the resolution boundaries even further. Focus stacking underwater requires high precision calibration of the optical system. In addition, 8k raw workflow in combination with stacking and deconvolution is exceptionally computer resource demanding. Our vision and colour perception is finely tuned for our out-of-water world. Underwater our brains struggle to interpret colours. Water absorbs light in a different way compared to air. For example, it absorbs longer visible wavelengths faster than the shorter ones. To compensate the missing red parts of the spectrum underwater, divers traditionally bring white light torches with artificial spectrum. They use the same light sources for underwater photography and cinematography. Unfortunately, in this way we miss many colours, misinterpret biologically relevant pigmentation, and make a lot of subjective assumptions about how to “translate” underwater colours to our screens. Marine researchers are only beginning to understand the complex phenomena involved in underwater animal colouration and vision. Here at BioQuest Studios we are striving to stay up to date with the current developments in the field of marine vision, fluorescence, bioluminescence, polarized light, etc. We then use the information to establish our image acquisition techniques. A particularly challenging physical property of pigmentation of many types of marine animals is fluorescence. 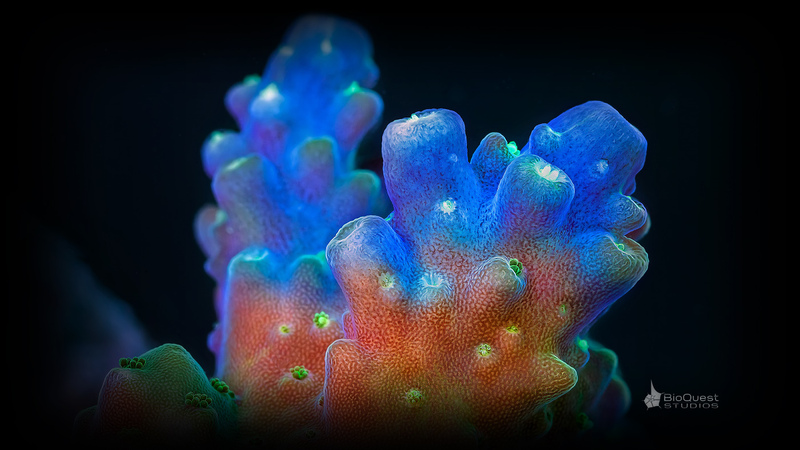 The colours of corals, for example, naturally depend on the spectrum of ambient or artificial lights. 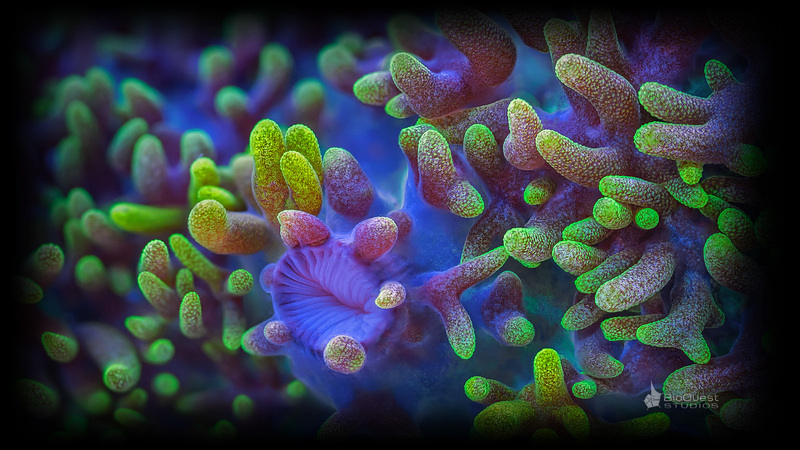 We customize our lights to produce the most vivid, accurate, and biologically relevant colours of marine animals. We receive a large number of questions about how “natural” or “graded” the colours and even details are in our macro images. The short answer is we do not make colours up or put corals under light spectra they do not have in their natural habitat. In reality, colour interpretation is a complex topic. In addition, scientists and photographers don’t necessary agree on the amount of “fair” image manipulation, such as extension of the dynamic range in HDR, focus stacking, and the types of computer-based digital image processing. We have summarised our image editing and acquisition ethics on the page below. 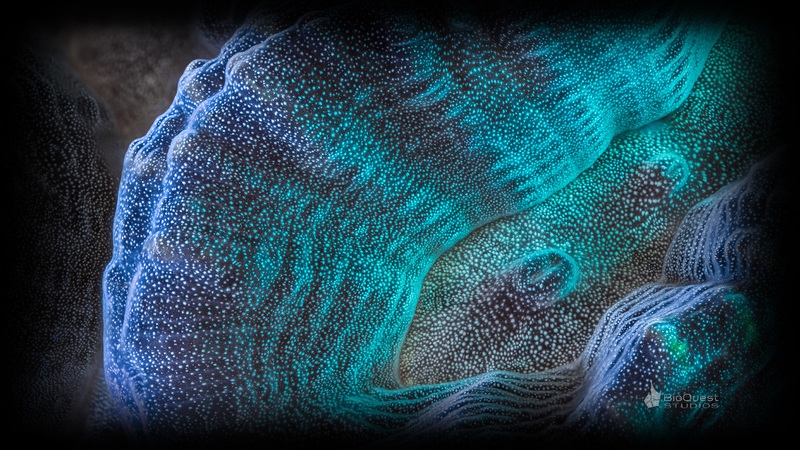 We apply focus stacking and wide-spectrum fluorescence techniques on various marine invertebrates beyond corals. While most people associate coral reefs with coral, the reef is a complex, diverse, and dynamic ecosystem. 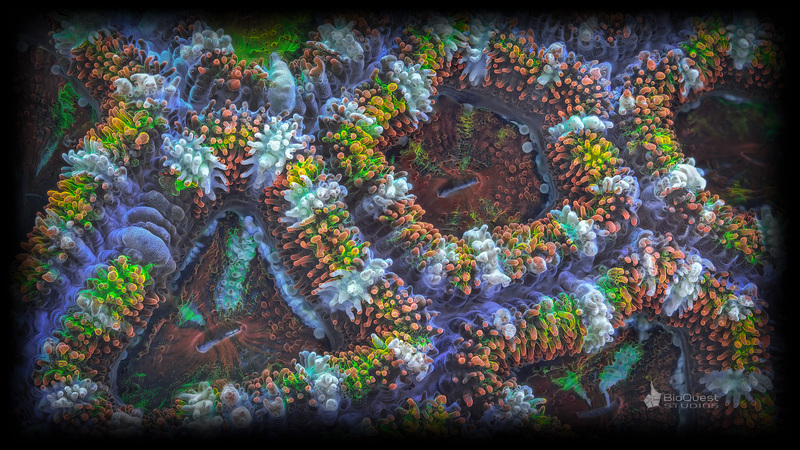 The reef is an association of various organisms, including microscopic ones. There are no “more important” or “less important” players in it. Yet, a lot of other invertebrates are unrecognisably spectacular up close. 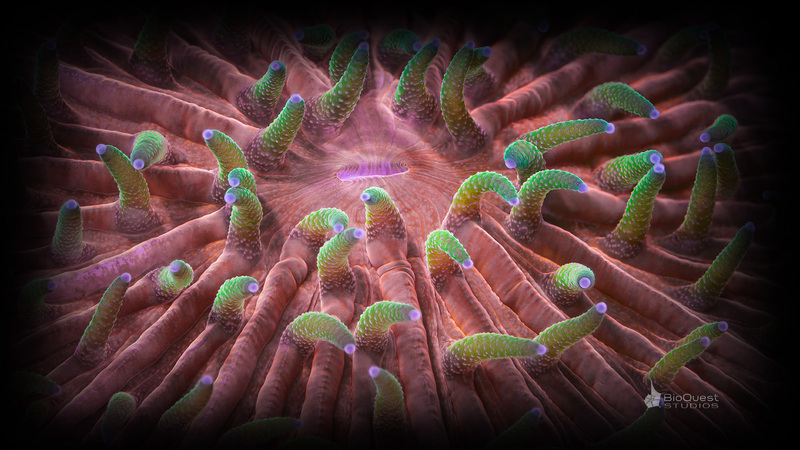 High-end biological microscopes produce sharp and clear images of the smallest living organisms. However, high-resolution objectives have even smaller depth of field compared to supermacro lenses. Traditionally microscopy has involved either taking single shots of small objects or sections. More advanced biological techniques involve the use of fluorescence staining, image deconvolution, 3d reconstructions, and multiple other techniques requiring computer processing. Demands on increasing resolution and the amount of what we see in microscopic cells and animals puts tremendous pressure on cells and organisms. Biologists immobilize little critters, introduce stains, and genetically modify cells to introduce fluorescent proteins. At the other extreme, higher resolution electron microscopy involves fully desiccating animals and covering with metal-containing substances. Here at BioQuest Studios we create optical reconstructions of live undamaged animals. Similarly to focus stacking in macro photography (photomacrography), our process involves taking multiple exposures at very high speed. On average, several hundreds per object. However, due to transparent nature of microscopic structures and limitations of focus stacking software, the majority of this process has to be done manually. Long and laborious techniques produce unique high-resolution images of microscopic plankton and pond inhabitants. 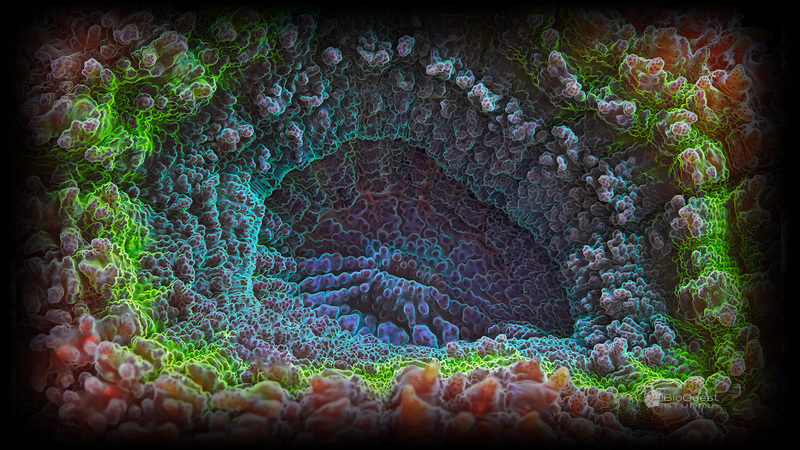 Unlike most available light microscopy imagery, our work features a tremendous amount of detail. As with our supermacro photography, our photomicrography can be printed on very large surfaces without significant quality loss. As our production process is exceptionally time-demanding, we release a very limited number of images. The diversity of microscopic life is one of the trickiest subjects in biology. There has been a significant shift in study approaches over the last few decades. The current approaches in life science often dictate to study organisms with molecular biology and bioinformatics tools. Academia economics favours bulk studies, computer-based work, and research topic that follow one narrow route. Some biologists never get the chance to actually see their research subjects or to work with them in the field. Unfortunately, the problem becomes even more pronounced with the shortage of experienced taxonomists. For people who could analyse morphological features and recognize animals at their morphological level it becomes harder to find a place in the academia and to publish papers. With advantages and disadvantages of the current trends, photomicrography nowadays is left in hands of enthusiasts and professional photographers. Not surprisingly, advanced microscopy imaging skills are seldom employed to produce images of “non-mainstream” animals. As photomicrography by itself is time-demanding, expensive, and often unrewarding occupation, most gorgeous-looking invertebrates, unicellular organisms, and algae are regularly left out. Our image acquisition techniques capture 3D data that can be used to generate 3d models and stereo images. 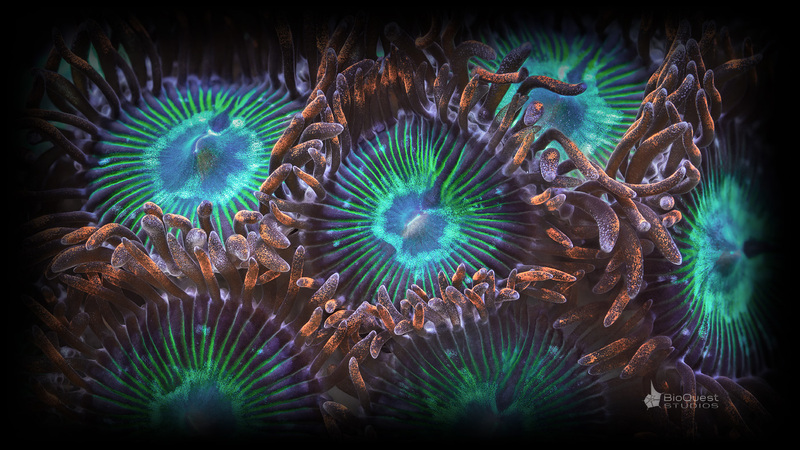 3D images are particularly informative and spectacular with supermacro of corals. Such type of media requires specialized screens to be visualized. On a traditional 2D screen stereo images can be visualized in several ways. The image above can be viewed using the cross-eye technique. You can find description of this stereo viewing method online, however it requires long practice for most people. Please contact us for full-resolution samples in formats suitable for 3D displays.